“Right.” We adjourned to the bedroom for a diaper change only to find out there was, in fact, a 4 wipe peepoo. After a several minute cleanup and several muttered curse words, I managed to change and dress John. “Dayee, bat.” John reminded me. I started the bath and made sure the water wasn’t too hot. Just then I sensed motion behind me and turned around just as 29 pounds of toddler came flying into the bathroom and dove over the edge of the tub like Superman, face planting fully-clothed in a couple inches of warm water. 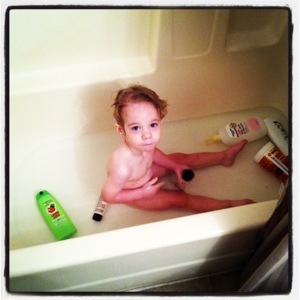 “I guess so.” I undressed him and bath time began in earnest. Several minutes later, all of mama’s products decorated the bottom of the tub and a gallon or two of water pooled on the bathroom floor. I decided bat-time was over. John got a bath and daddy got a shire. I wrapped him in a towel and sat him on the bed while I went to pick out dry clothes. I’d just gotten into his room when he called from the other room.